Jonathan Rea was fastest in free practice on Thursday in Qatar. Jonathan Rea began his quest to set a points record in the World Superbike Championship in fine style as the Ulster rider topped free practice in Qatar on Thursday night. 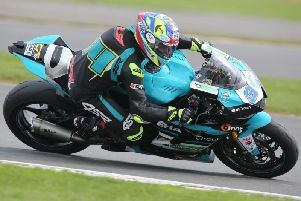 The Kawasaki star has already made history this season after becoming the first competitor ever to win the title three times in succession, wrapping up the championship with victory in the opening race at Magny-Cours in France with two rounds to go. Eugene Laverty was ninth fastest on the Milwaukee Aprilia in opening practice at the Losail International Circuit. Rea achieved another personal target when he powered to his maiden victories at Jerez in Spain last month, chalking up his fifth double of the season as the 30-year-old matched his record of 14 wins from his maiden title-winning season in 2015. The Losail International Circuit in Qatar is now the only venue on the current calendar where Rea has never managed to win, but he is determined to set the record straight in the opening race, which takes place on Friday night (18:00 GMT) in a change from the usual race weekend schedule. Race two will be held at the same time on Saturday as the 2017 championship reaches a conclusion. Should the Ballyclare man clinch another double at the desert circuit, Rea would establish a new record for the most points accumulated in a single season. American star Colin Edwards set a benchmark of 552 points in 2002 but Rea has set out his stall in free practice and is eager to finish a dream year on a high. “Jerez was an amazing weekend, it has always been a good circuit for us during the winter tests but this year we managed to be really strong all weekend in the races,” he said. “This has given us good momentum to take into Qatar. This is the last round and I want to finish well. “I enjoy the atmosphere there as it is a chilled out paddock and the night time race adds a bit of excitement between the riders and teams. “The layout suits me and there are a lot of high speed corners there,” added Rea. “It is important to maximise the grip as the track is in the middle of the desert and early in the weekend there is not so much rubber down. So we need to pay attention to that. Under the floodlights, Rea posted the fastest time in 1m 57.666s in FP1, which put him almost seven tenths clear of team-mate Tom Sykes. However, Pata Yamaha’s Alex Lowes improved his time in FP2, reducing the deficit at the top of the combined times to 0.259s as he led the way in the second session. Rea said: "“Today went OK and I really enjoyed it. I just like this race meeting. The circuit is very nice, it has got a lot of challenges and riding under the light does not take much getting used to, but it is just different and exciting. “We changed the balance of the bike quite a lot today, in the first session and between sessions, just searching for that last little bit of front stability. Wales’ Chaz Davies (Aruba.it Ducati) was fourth quickest behind Sykes, with Michael van der Mark (Pata Yamaha) completing the top five. Davies and Sykes are set to battle it out for the runner-up spot in the championship this weekend, with both riders tied on 363 points. Toome man Eugene Laverty was ninth fastest overall on the Milwaukee Aprilia. Laverty said: “FP1 wasn't so bad, but I was really having to ride on the limit to stay in the top six, which is never a nice feeling. We did a lot of work with the deceleration of the bike to get it stopped quicker, but it's an area that still needs improving. “Rear grip was an issue in FP2, I think it was for everybody after the red flag delay which made the surface quite slippery. We got through to Superpole 2, which was positive, but for sure we need to work on these problems tonight,” he added. “We worked well today and we tried some different settings, but the bike didn't respond how we wanted and that was frustrating.